This trailer has been maintained to the highest standard. When not on the road it lives in inside storage. During the last four years it has had the following new upgrades: Shaw Direct satellite dish, Splendid Washer/Dryer, heated towel warmer, new Thetford toilet, water pump, inverter, solar panels, tires, shocks, outside LED lights, stove, fridge, Microwave convection oven, TV, sound system, slide toppers, built-in water softener and charcoal filters, new landing gear, brake actuator for new GM controllers. 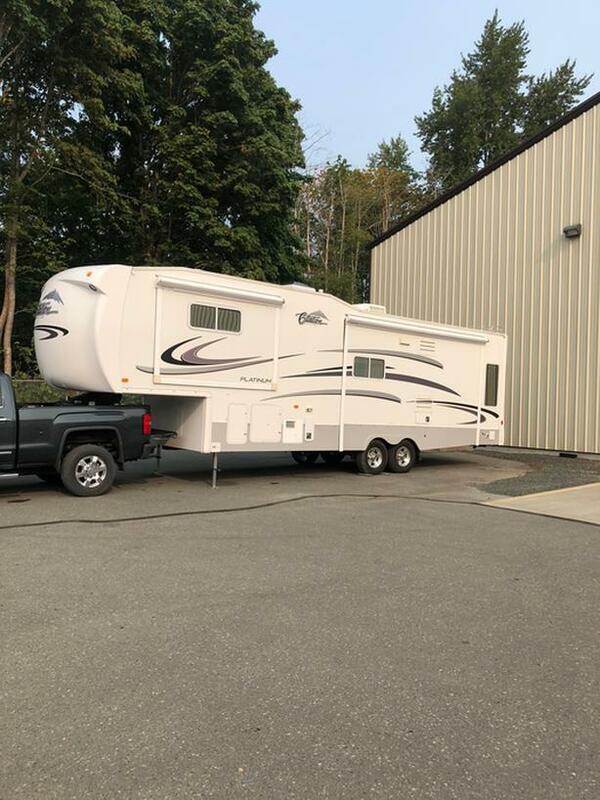 Features include: king size bed, power jacks, hydraulic brakes, Moryde hitch, rain sensor vent, Arctic package including thermal windows, power awning, A/C Heat pump, dual furnaces, built-in vacuum, electric fireplace, slide out tray in basement, Karadon countertops in kitchen and bathroom. 2017 GMC Denali 3500 Duramax could be purchase with this unit if needed.